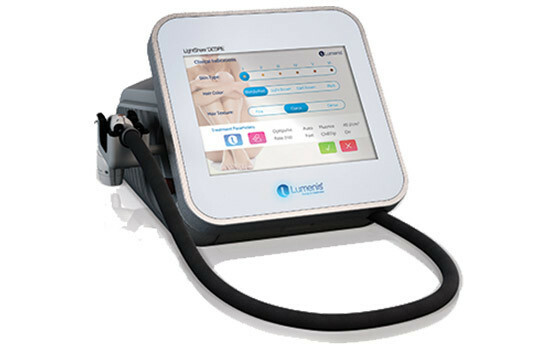 To meet these needs, Lumenis, a leader in laser and energy based technologies, developed the LightSheer DESIRE, the new generation of Laser Hair Reduction system from the LightSheer Family of products so you can grow your business by offering your patients what they DESIRE. Hair removal, permanent hair reduction, and the treatment of Pseudofolliculitis Barbae(PFB). Treatment of vascular lesions, including angiomas, hemangiomas, telangiectasia, leg veins, and other benign vascular lesions. The LightSheer DESIRE uses an 805nm diode wavelength. This wavelength is the industry’s Gold-Standard and has been clinically proven to safely and effectively treat all skin types. High-Speed Integrated Technology (HIT ™) and ChillTip ™ Technology. The low fluence HIT uses a customized vacuum that reduces treatment time by more than 75%, increases treatment safety and efficacy and significantly improves patient comfort. The high fluence ChillTip Technology applies a cooling mechanism to chill the skin before and during treatment, increasing treatment efficacy and patient comfort. 1. Faster Treatment High-Speed Integrated Technology (HIT™) reduces treatment time by more than 75%. Using the 22x35mm spot size, large areas as the back and legs can be treated in less than 10 minutes. THE HIT ™ eliminates the lengthy preparation time need for cooling or anesthetics. 2. Ultimate Patient Comfort High-Speed Integrated Technology (HIT™) uses a unique vacuum mechanism that activates the skin’s tactile and pressure receptors to inhibit the transmission of pain. ChillTip™ Technology improves patient comfort by cooling the skin prior to treatment and continuously cooling it throughout the treatment. 3. Clinically Validated Efficacy Numerous clinical studies and peer review articles have validated the safety and efficacy of the technologies powering the LightSheer DESIRE. Thousands of satisfied customers have been and are still benefiting from the gold standard performance and patient satisfaction.